The only shops where the more you buy, the better. You’re giving to a good cause, you can feel good about yourself because instead of supporting some worldwide corporate chain, you’re supporting a worthwhile cause. – I believe it’s good for the soul. EMMA, Picked up in the OXFAM in Richmond. There’s a lot of joy to be had. You just don’t know what you’re going to find as they replenish their stock so often. I’m always finding books for £1-2 that are still in Smiths and Waterstones at full price. You don’t tend to get moody shop assistants. They’re there because they want to be. There’s always a friendly smile and a big thank you. – Makes all the difference. 5. EVERYTHING IS – I hate using the word cheap so I’ll say: GOOD VALUE FOR MONEY. Everything tends to be priced very reasonably and there’s usually a bargain to be found. Finding these bargains is all part of the fun. Recently published cookery book for £2? Yup add that to the pile. 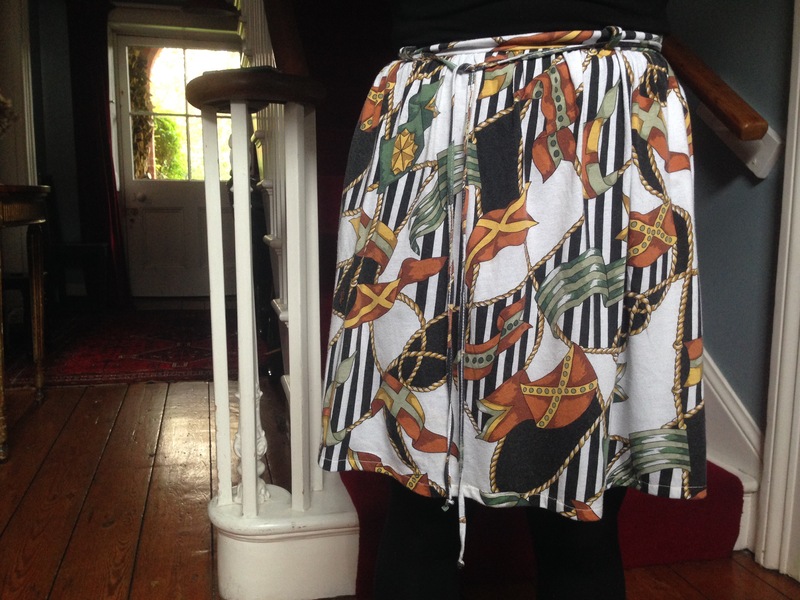 My good friend Cathy’s printed skirt, found in Oxfam. It’s a win win for everyone. Now go find your nearest hub of goodwill and splurge on some second hand books. Posted in 5 THINGS and tagged books, charity, charity shop, FASHION, happiness, happy, LIFE, lifestyle, shop, skirt, STYLE, thrift store. Bookmark the permalink.